The 2nd Coat of Plaster is where the magic can happen! Don't peak too early and spend ages trying to make the 1st coat of plaster perfect. The 1st coat really is just a base for the 2nd coat of plaster which when applied can be like magic - going on in a far superior way - feeling silky as your trowel almost glides over the wall to push a thin smear of 2nd coat plaster giving a far superior finish than a 1st coat ever can. The second coat of plaster is really is all about timings – if the 1st coat becomes dry too quickly due to poor suction control or because you've left it too long - then the 2nd coat of plaster will not go on as nice. It should be applied to a 1st coat that is tacky but not too wet – almost putty like, so that whilst you can mark it with your finger tips and feel them pushing in to the plaster, it will not come off onto your fingers. If the plaster comes off on your fingers then it is to wet and needs a bit longer to firm up – but go with the average - check it in a few different areas. If the 1st coat becomes too firm and is not at all pliable then don't worry – just get the 2nd coat on promptly. You'll find it needs to be applied slightly thicker than normal and doesn't glide quite as easily, taking a bit more working to achieve a nice flat surface that is relatively hole/hollow free. The objective of the 1st coat of finish plaster is just to be flat – think of it as the foundations. 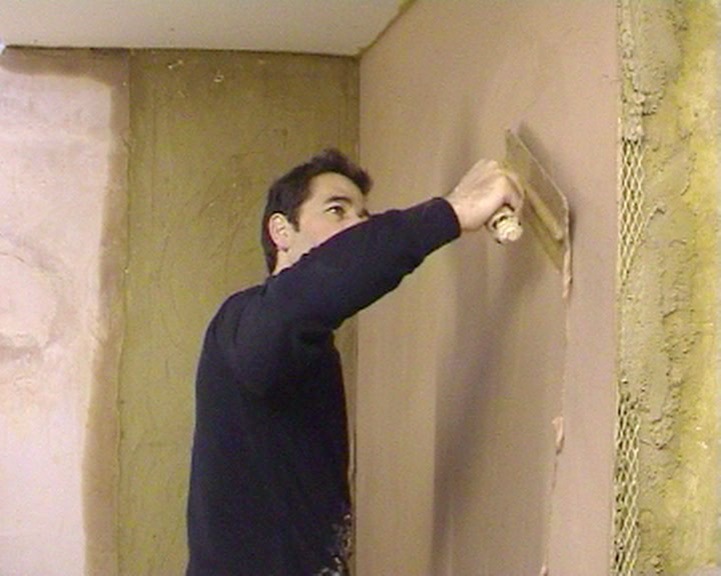 This 1st coat of plaster can have many trowel marks and ridges – this is no problem, as when the plaster has firmed up a little these ridges will easily be knocked back by trowelling them out (Stage 2). This happens when the majority of the plaster has firmed up a little, still soft enough to be able to knock off the highs, but too firm to risk pushing it out of shape. Do Stage 2 it too early and you may lose the flatness. The only time a 1st coat can come close to performing as well as the 2nd coat is when skimming onto plasterboard, which if fixed flat provides a uniform surface to apply plaster to. When skimming a plasterboard wall sometimes a 2nd coat can be applied as normal or sometimes just a very thin 2nd coat will suffice – almost trowelling and smoothing the 1st coat of plaster with a very thin additional amount being applied. If in doubt just apply a full 2nd Coat. If it all goes wrong and the 2nd coat does not go on as nicely as you feel it should - then sometimes rather than spend ages trying to get a good finish - it can be easier to put a 3rd coat on. Get the timings right and this can also give you a great surface ready for trowelling to a nice smooth even finish. Answers to questions about the 2nd coat can be viewed here or you can ask your own.